My Weekly Indicators post is up at XE.com . Lots and lots of "less worse." 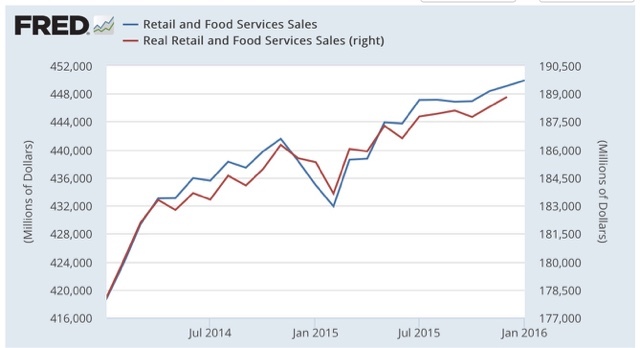 This morning's retail sales report gives us confirmation that the consumer economy - about 70% of the entire US economy - is alright. While we don't know what the CPI for January is yet, we do know that gas prices continued to decline smartly, so I am not expecting a number over +0.1%, and truth be told, I am not expecting a positive number at all. Not only was January a positive both including and excluding autos, but December was revised significantly higher, from -0.1% to +.2%. 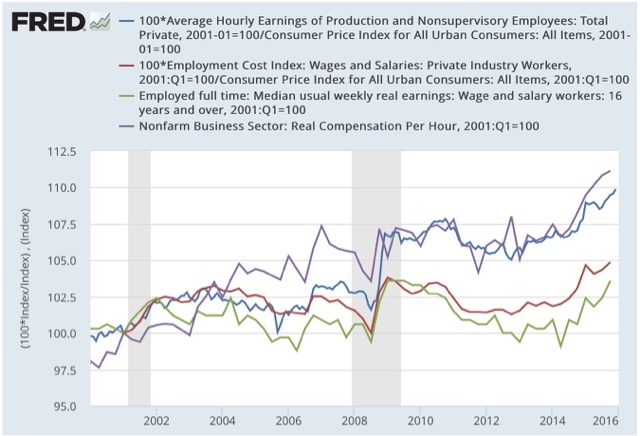 1..Workers/consumers have more jobs, and are making and spending more money. 2. Producers of commodities, and utilities and transporters of commodities are experiencing a very intense downturn, that so far has not dragged down non-commodity industrial production at all. 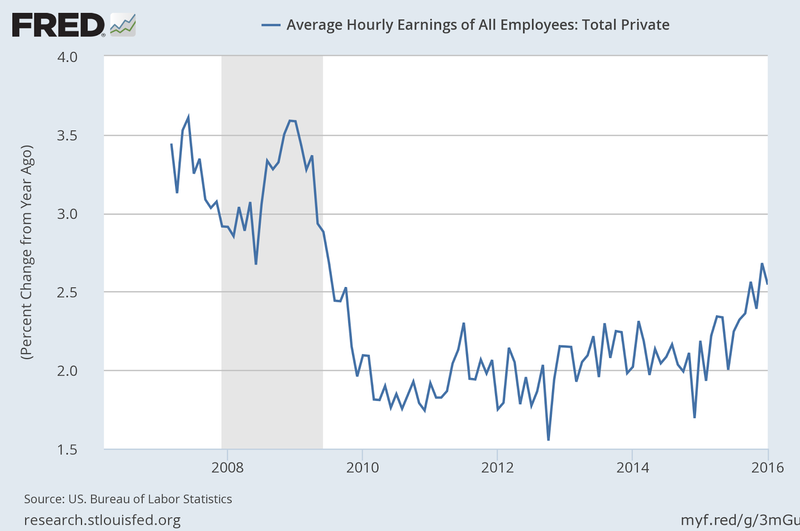 In the last several years, I have written a number of posts documenting the stagnation in average and median wages, for example here and here. 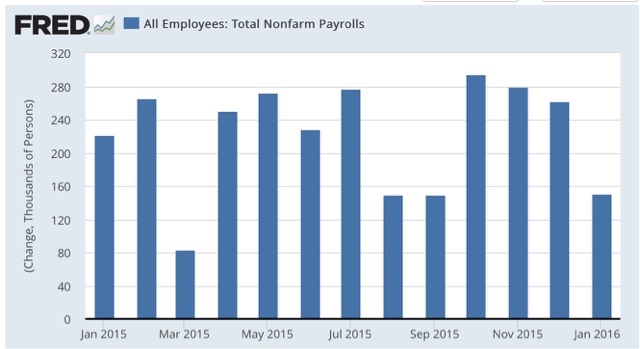 Courtesy of the crash in gas prices and the decline in underemployment below 10%, there has been a change in the last 16 months. All of these have now been updated through the fourth Quarter of 2015. Let's take a look at them. 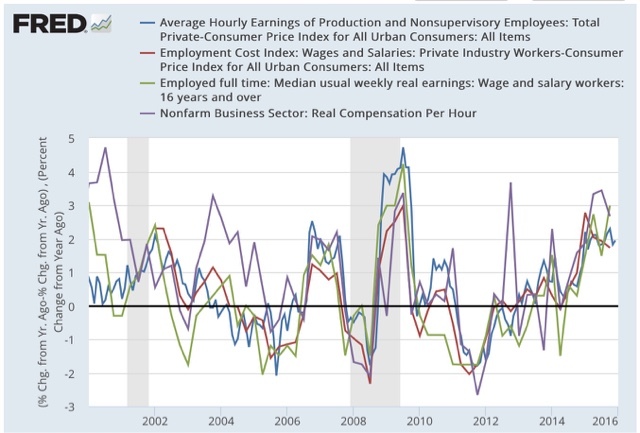 "Real usual weekly earnings" is now equal to its highest level since the beginning of the Millennium. The other three are at Millennium highs (as far back as two of them go). 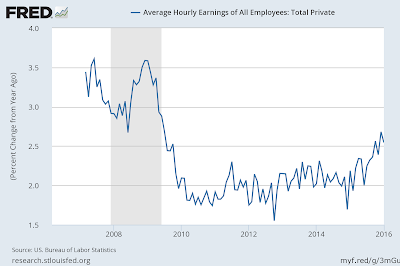 Real average hourly earnings can be calculated back 60 years. It is at a new 35 year high -- but still lags behind its high point in the early 1970s. And there has been an acceleration in growth in the last year. I don't want to oversell this improvement. It is still not nearly good enough to have a viabrant middle class. But it does represent a significant positive. 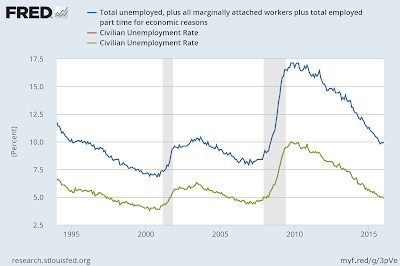 In a post titled "Talkin' Unemployment Blues" Scott Johnson of the Powerline Blog referenced the following chart from "Shadowstats:"
I wonder how Mr. Johnson would explain that rather glaring logical inconsistency? This is but one of the many problems with SS numbers. According to SS, their "alternate" CPI index based on 1980 calculations is ~7.5%. If that were really the case, the 10-year would now be trading at a -5.75 yield. (Just to help Mr. Johnson out: the current 10-year CMT was 1.75% at the close of yesterday's trading. 1.75 - 7.5 = -5.75%. In case you were wondering, that's called "subtraction" which is a basic mathematical function.) Trust me on this one: if the 10 year were trading at 5.75%, you'd be hearing about it. Here's the point. The guys at Powerline aren't clueless; that description might imply that, at some point, they had a clue. No: Powerline's writers are economically clue free. Over the last few weeks, I pointed out that John Hinderaker -- who is now in charge of a conservative think tank -- thinks Minnesota should change economic policies. This, when the state's unemployment rate is below 4% and wage gains are between 2.5%-5% Y/Y. And now Scott Johnson is partially basing his argument on Shadowstats -- a website used by, quite literally, no reputable economist. And this is before we consider that these guys spent the entire 2014 blog year providing economic commentary that was, literally, 100% incorrect. That's just dumbfounding. This post will have no impact on Powerline. They'll continue to argue that they are economic geniuses. And we'll be here to document the latest economic missive from the cluefree crowd at Powerline as they post. 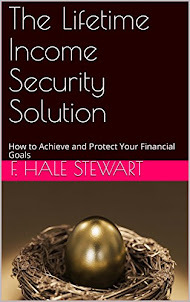 I have a new post up at XE.com . 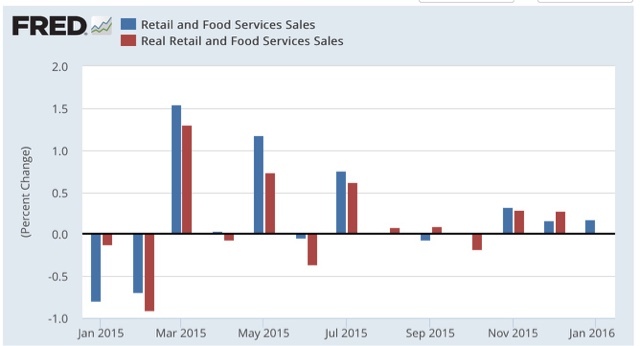 A whole bunch of important data series moved pretty much in lockstep in 2015. In the last month, that has broken down. 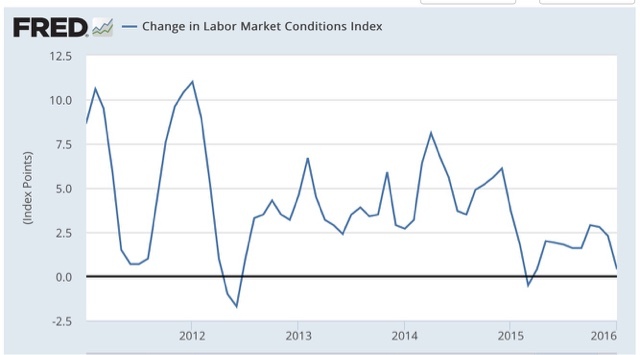 Last summer I wrote that the Labor Market Conditions Index, a measure based on 19 components which was just reported just barely up +0.4 for January, was a useful addition to the forecasting toolbox. 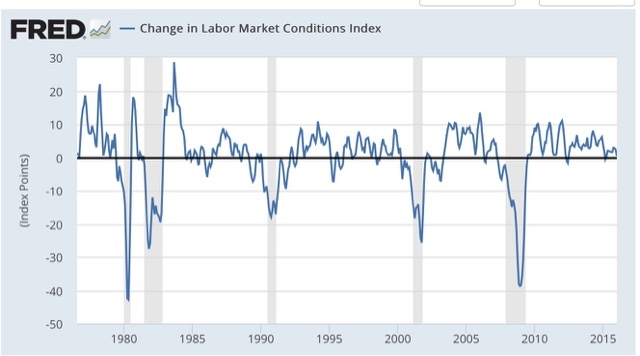 The index has with one exception (1981's double-dip) always failed to make a new high for at least 12 months before the next recession, sometimes much longer than that. 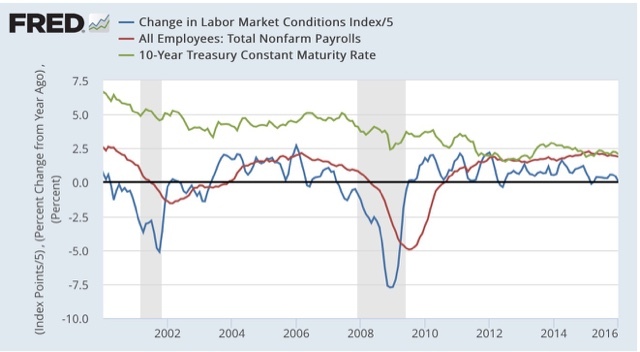 Further, it has always dropped below 0 and stayed negative for 6 months or somewhat more before the onset of the next recession. The Index appears to have made its cycle high at the beginning of 2012, with a secondary high in early 2014. But it has not turned negative. 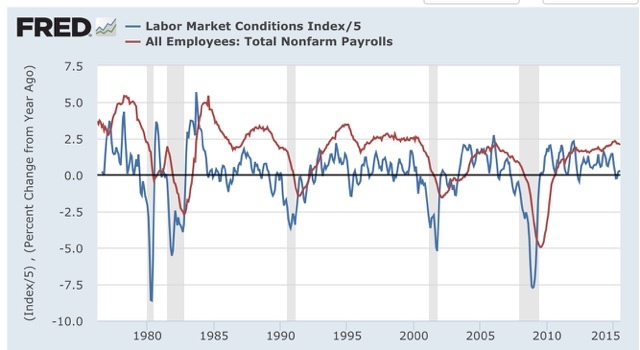 On the negative side, since the LMCI does lead the much smoother YoY growth in jobs, it strongly suggests that YoY payroll growth is going to decline over the next 6 months or so. Six months ago I wrote that such a declien could "only happen if those payroll numbers generally come in under 225,000, and probably even below 200,000 through next winter." I have a confession: the boys at Powerline utterly fascinate me. On paper, they are smart guys: all of them are ivy league educated and all are lawyers with a large national firm. And I'm sure that, if you needed a top-notch commercial litigator out of Minnesota, one of these guys would be on the list to call. But these guys just can't get anything right when it comes to economics. I mean nothing. You'd think that after making nothing but erroneous calls for an entire year, they'd call it quits. But, you'd be wrong. President Obama made an appearance in the White House press room on Friday to take a victory lap over the fall of the official unemployment rate (U-3) to 4.9 percent (video below, about 15 minutes). Is that number for real? Referring to the hell he saw tending to wounded men during the Civil War, Walt Whitman held that “the real war will never get in the books.” By the same token,I wonder if the real unemployment will ever get in the books. That's right. At the beginning of his term, when the financial world was literally collapsing around him, Obama secretly fired the entire staff of the BLS so they could cook the statistical books. That's why the unemployment rate climbed for the first few years of Obama's term, finally hitting 10% in 2010. Then, the rate moved lower for the remainder of his term. If he's going to hire people to manipulate the data, you'd think they'd do a better job than a gradual rate of decline. But that's not the best part. Next, Johnson quotes Shadowstats. Yes, he actually relies on data from Shadowstats. Johnson even uses a graph from the website that shows a "real" unemployment rate of about 22.5%. Note to Mr. Johnson: SS was debunked about 8 years ago by James Hamilton (a leading economist, BTW) and the BLS. In quoting SS, you've basically demonstrated that you have no idea what you're talking about. The BLS projections show the LFP rate continuing its decline, reaching 62.5 percent in 2020 (using the 2010-2020 medium-term projection). Since 2000, the BLS has projected the long-term decline in the LFP rate, indicating that the high LFP rate that we saw in 2000 might be a figure of the past. In particular, the decline in women's LFP since 1999 is not expected to reverse. The BLS does not expect the large decline in the LFP rates for the youngest group, 16-24-year-olds, to reverse either. To the extent that the decline for the youngest group is due to the time spent at school, it is possible that these workers will show a higher labor force attachment once they are out of school. In other words, the reports shows that: demographers and statisticians have known about this decline for some time. They have also studied it and can explain it. While Johnson thinks the report bolsters his credibility, it only shows that he's clueless. As in totally clueless. Memo to Powerline: econ is not your thing. It's really not. 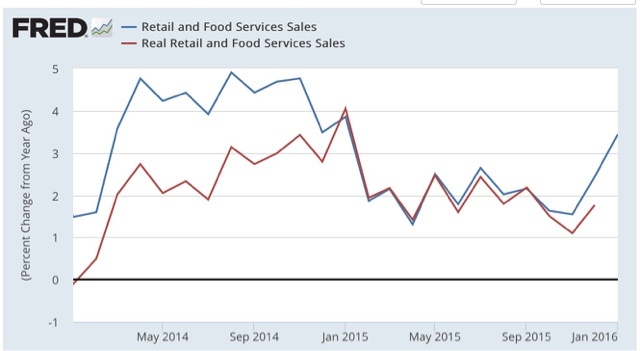 There is a serious problem with simple YoY measures: they miss turning points. 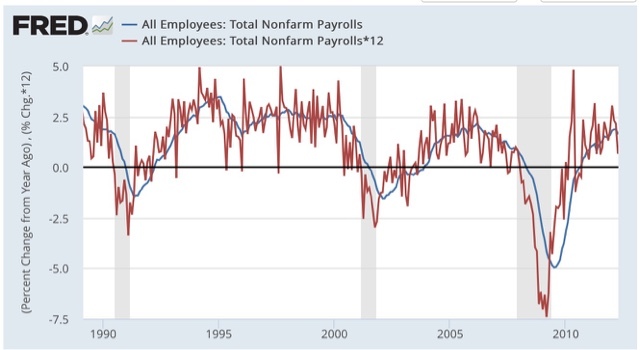 By the time a YoY measure has changed from positive to negative, or visa versa, the turning point is usually long past. Jobs are a horribly lagging indicator. 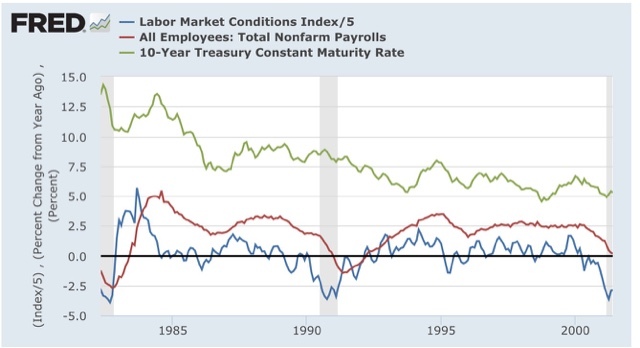 Recessions invariably start with the economy adding jobs as noted by the red squares in the above chart.... 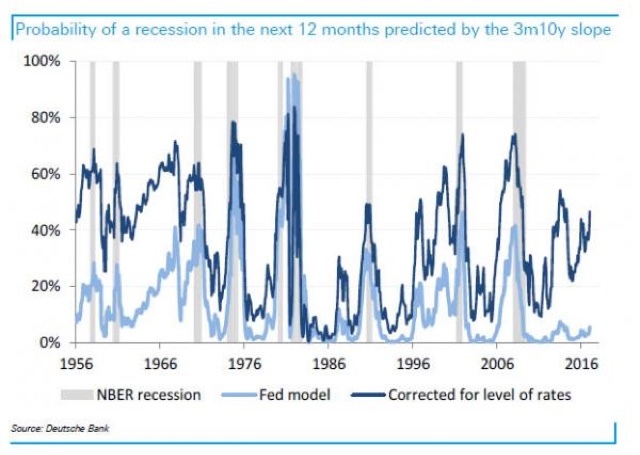 The peak of the job losses in most recessions is after the recession is over. Now, I don't mean to pick on Shedlock. As I have frequently pointed out, even though I disagree with him at least 80% of the time, I appreciate that he always dives into the data, and makes me think. The bottom line is, when we have monthly or quarterly seasonally adjusted data, that is what we should use. Waiting for a YoY number to turn positive or negative will just cause you to miss the actual turning point. But frequently there is no choice, because there is no seasonal adjustment. Most of what I report in my "Weekly Indicators" columns has this issue -- for example, consumer spending measures, the Daily Treasury Report, and rail traffic. 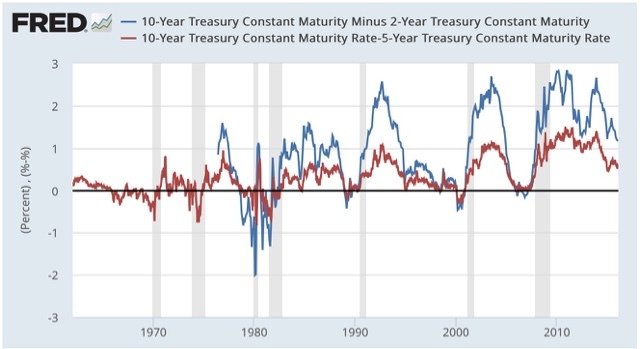 To not miss turning points, I use a rule of thumb: if a series has improved/declined 50% or more from its best/worst YoY measure (adjusted for inflation if necessary), it has probably made a top/bottom, and turned. It's not exact, but it is much better than waiting for the YoY number itself to turn. Whether the turning point using this rule of thumb is a little early or a little late depends on whether the turning point is U-ish or V-ish (inverted for tops). If it is U-ish, the rule of thumb probably leads some. If V-ish, the rule of thumb probably lags. 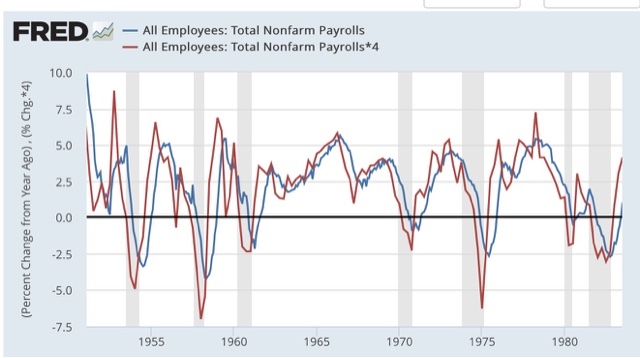 For example, the YoY measure of jobs tends to have inverted U-ish tops, and V-ish bottoms. 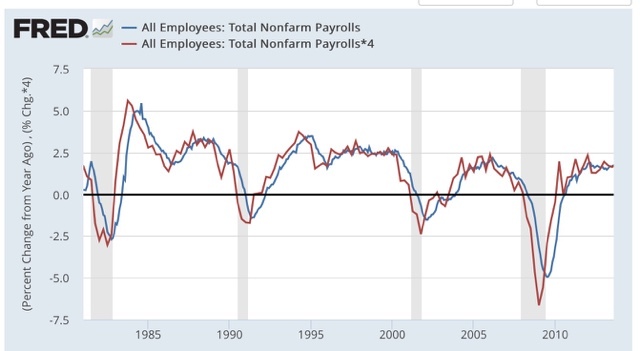 Applying my rule of thumb to the last 7 recessions, YoY% job growth declined 1/2 off its high 5 times before the actual onset of recession, with a median lead of +3 months. The 1/2 YoY% of job grain off the bottom lagged each time, with a median lag of -8 months. 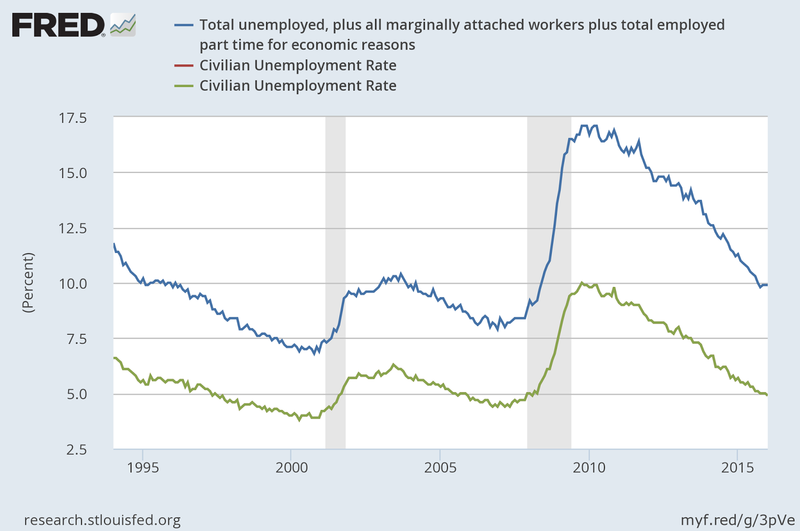 (When it comes to jobs, the bottom of the V tends to coincide with the month the recession ends! Thus recently I have been watching a number of indicators that have turned "less bad:" rail traffic, steel production, and temporary staffing. I am also watching two that have become somewhat "less good:" tax withholding and gas usage. But note that YoY rail traffic bottomed in early 2009. It was about 1/2 the way back towards positive territory by October 2009. Waiting for it to turn positive meant you would wait until early 2010 (in real time Shedlock made this exact mistake!). 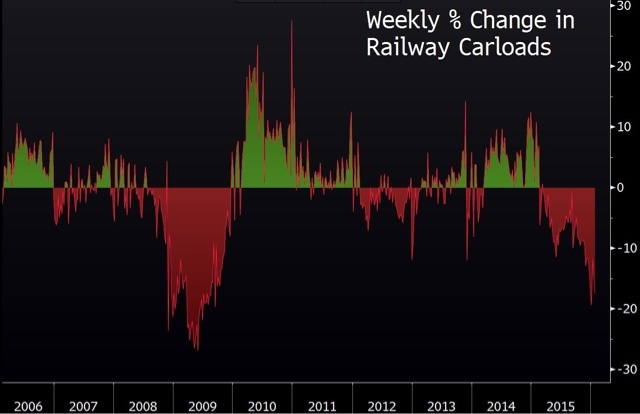 At its recent worst, rail traffic was off about -20% YoY. If it declines to less than -10% for about a month, that will strongly suggest that the bottom of the industrial recession has been made. I caught this over at Zero Hedge. Since I can't find the original source online, it apparently started out in a private presentation by Dominc Konstam of Deutsche Bank. Yesiree, it certainly does show that. 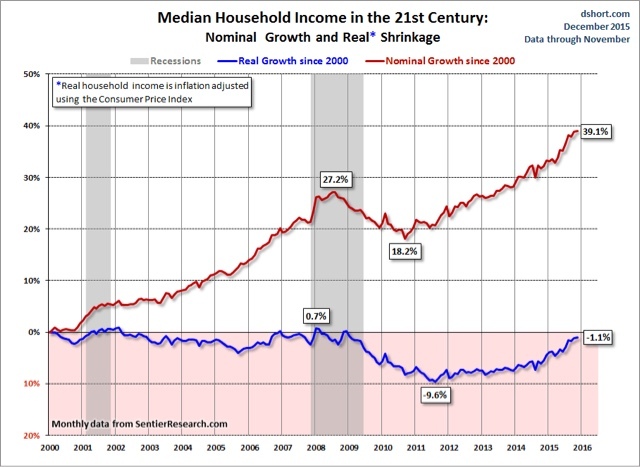 Apparently, the US was teetering on the edge of recession throughout the entire decade. Hoocudanode?!? So here is a helpful hint. When your Killer App for Foreceasting Recessions, forecast a recession during the two best economies that the US has had in the last 60 years, your Killer App is Crap.